Choosing the right hotel for your trip to Berlin can be a daunting task. Berlin, unlike many other cities in Europe, is a decentralized city. Instead of just one single city center, there are three main centers in Berlin. They have formed in the eastern part, the western part, and in the middle between these two. Each suburb, indeed each neighborhood, will also have a different flavor. To complicate things further, important points of interests such as the Brandenburg Gate, East Side Gallery, and Kurfurstendamm are spread out over a wide area. So the question is pretty legit, where to stay in Berlin? Therefore, many visitors to Berlin want to know which area works best for their specific itinerary before booking a hotel. Of course, they also want to know which hotel fits their travel budget. Rest assured, you’ve come to the right place. 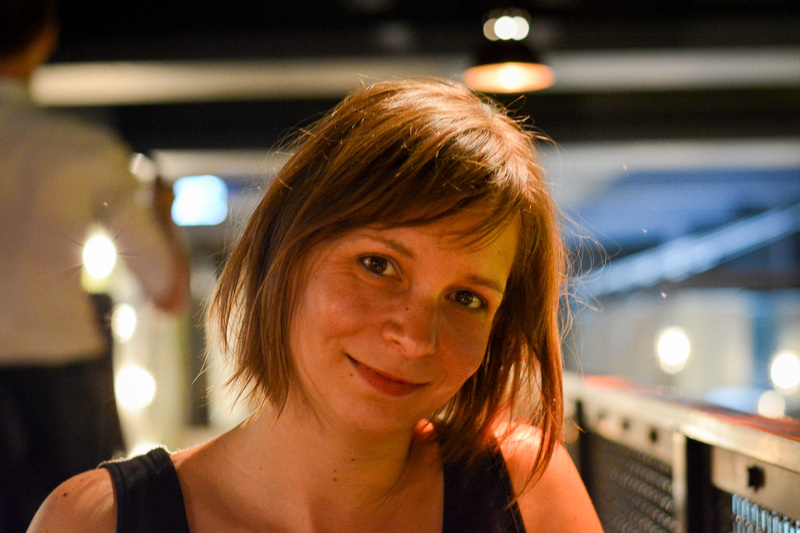 As a Berliner I can explain everything you need to know before you make a decision, so read on! In this article, I will give you an overview of the different areas of Berlin (loosely based on the official “Bezirke”), ordered by popularity. I will explain the advantages of each neighborhood as well as which attractions and points of interests you will find nearby. This rundown should give you a pretty good idea about what to expect for each area. On the bottom of the article I will also share with you a personal favorite. So if you just want a comfortable good value hotel in Berlin, scroll all the way to the bottom! Disclaimer: This article may include affiliate links. This means that if you make a hotel booking after clicking on any of these links, I may receive a small commission. 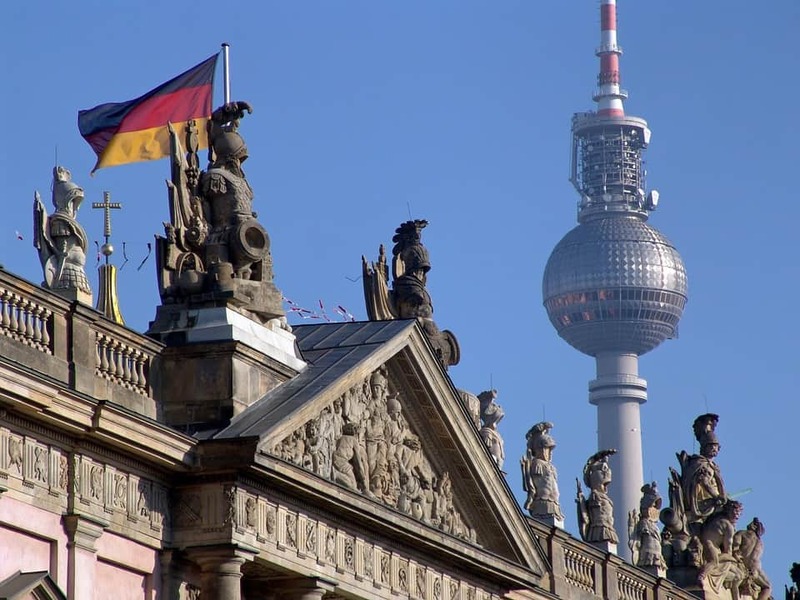 2 Berlin – A City Divided? Most accommodation options in Berlin can be found near known landmarks, but there are also alternatives available. Berlin is a big city spread out over a wide area. As said above, there are three main city centers, one in the former West (Wittenbergplatz), one in the former East (Alexanderplatz), and one right in middle on the former border between the two (Potsdamer Platz). In these centers you will find great shopping, big restaurant chains, and lots of exciting attractions and museums. If you want to stay close to the action, have a look at these three city centers. Besides these three core areas there are lots of suburbs such as Prenzlauer Berg, Friedrichshain, and Kreuzberg. This is where most Berliners live and work and go out at night. They call these areas their “Kiez”. Many Berliners don’t need to travel far, they tend to shop, work and play locally. If you want to meet the locals, eat trendy or exotic foods, and explore off the beaten path attractions and street art, select a hotel in a suburb. As you can see, it is important to know where to look. Having said that, Berlin has a very good public transport network. You will easily get around with a tourist pass. Therefore, I would suggest you make a choice based on what you want to do at night – are you a night owl, do you like good food, travelling with kids, prefer a quiet night? This will save you the long journey home to your hotel when your feet are tired in the evening. The Berlin Wall divided the city into two parts. The differences can be felt to this very day. Berlin – A City Divided? As you may remember from your history lessons, Berlin used to be a divided city. The Eastern part was ruled by the powers of East Germany, basically a puppet of the Soviet Union. The Western part was ruled the by Allies who each controlled one section of West Berlin: France, America, and the United Kingdom. Because many people sought to flee the East German regime in the 1950’s, the government decided to build a wall overnight to stop the exodus of people. From one day to the next, there was a physical border that surrounded West Berlin, the Berlin Wall. Anyone trying to cross this border illegally was shot on sight. The Wall existed until 1989. It caused not just a physical separation of the city, but also let the cultures in both parts develop differently. After the Fall of the Wall, it took many years to reunite the city, not just physically but also in people’s heads. Berlin Alexanderplatz is the city center in Berlin East. Due to the history of Berlin as a divided city there are two more city centers. As a visitor to Berlin you may notice subtle difference between East and West to this very day. East Berlin has a lot of charming turn-of-the-century apartment blocks, with quiet leafy cobblestone streets. In the very center around Alexanderplatz as well as further outside, huge sober apartment and office blocks dominate the streetscape, typical for a Eastern Bloc country. There is a good tram network connecting Alexanderplatz with the inner Eastern suburbs. In the West, you will find a different type of architecture, one that may remind you of other West German cities like Hamburg or Frankfurt. While a lot of old buildings were preserved in East Germany, it was a different story of the more dynamic and prosperous West. It is a pleasing setting with less contrast than in the East, yet it also lacks the charm of days gone by. However, just like in the East, each neighborhood has its own center with shops and restaurants. In recent years, a lot of ultra-modern apartments and office towers made of glass and concrete popped up along the former border where the wall once stood, in particular in the East. You will notice that these new building complexes are farthest away from neighborhood cores (Kiezes) since they developed in areas that used to be on the fringe of the city. Some of the best known Berlin attractions such as the Brandenburg Gate can be found in Mitte. Berlin Mitte covers a wide area and is the former city center of East Berlin. Since it is the historic center of the city, you will find lots of famous attractions nearby. In the neighborhood of Brandenburg Gate you will find the Reichstag (German Parliament) as well as lots of other ultra-modern government buildings. There is the historic boulevard Unter den Linden with its palaces and the State Opera leading to Museum Island. Museum Island is home to a number of UNESCO listed world-class museums. 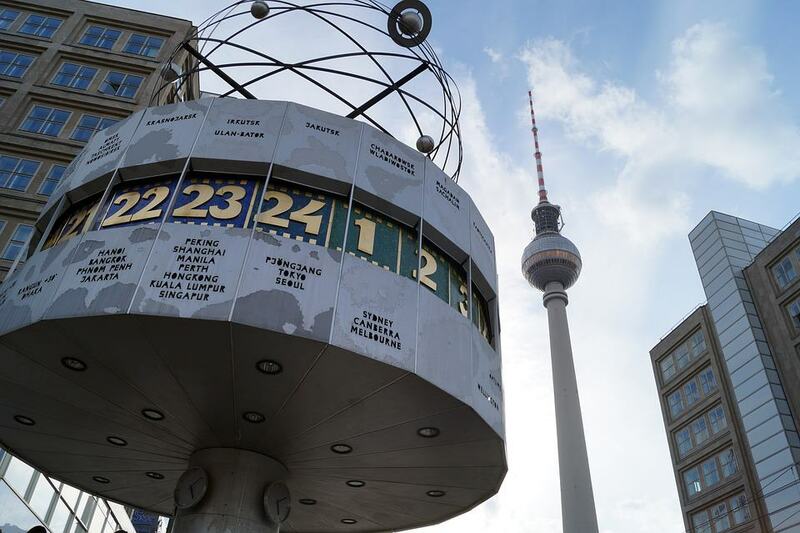 A little bit further, Alexanderplatz is the former core of East Berlin, today a major transport hub and shopping district. To the north, Hackesche Höfe is great for shopping and street art and is a prime example for old Berlin architecture. Potsdamer Platz is home to a number of modern shopping centers, interesting museums, and big chain restaurants. Who should stay in Berlin Mitte: Recommended for a first-time trip to Berlin to see all the major sights, and for families with children who want to stay close to the action. Definitely a pricier option due to the closeness to major tourist attractions. Reasons to stay in Berlin Mitte: Most of Berlin’s world-renown attractions at your fingertips. 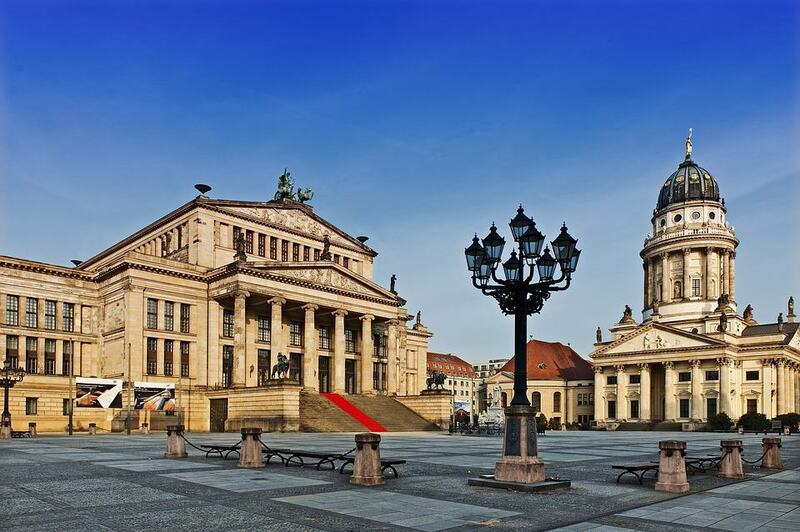 The romantic atmosphere of Gendarmenmarkt is perfect for a couple weekend in Berlin. 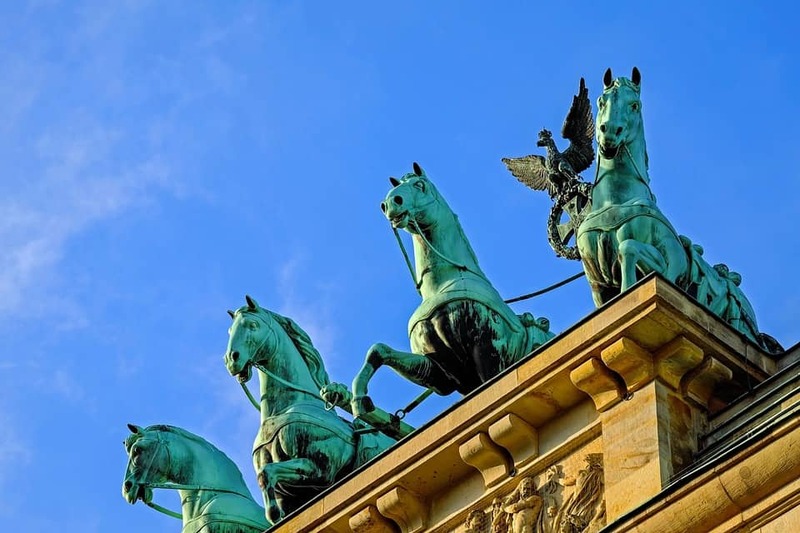 Berlin Mitte has three areas of interest when it comes to finding the right hotel: The areas around Brandenburg Gate, Alexanderplatz, and Potsdamer Platz. This is the historic core of Berlin where you will find a mix of old and new government buildings, the Central Station (Hauptbahnhof), a large park (Tiergarten), and boulevard Unter den Linden. There is exclusive shopping around Gendarmenmarkt and Friedrichstrasse, and good German restaurants in the historic Nicolai Quarter. It’s a quiet area with not a lot of nightlife and some very expensive hotels and restaurants catering for business people, diplomats, and well-off visitors. This is not a budget-friendly option. The Adlon is one of Germany’s best known hotels. It overlooks Brandenburg Gate and is located in a quiet area with not a lot of traffic. The interior is classic and stylish, the restaurants first-class, the fitness area huge. It is one of the hotels that you would pick for your honeymoon if you can afford it, or for a once-in-a-lifetime stay in the capital. What are the cons? Hotel Adlon Kempinski is not a cheap choice. This is a luxury hotel which is quite removed from the kind of Berlin that locals experience. Great value for money hotel with modern rooms in Friedrichstrasse. It’s an extremely central base from which to see all Mitte attractions by foot including Brandenburg Gate and Museum Island. It’s more of a functional hotel where you can spend the night in peace, but not so much an exceptional hotel experience. However, for a city trip it will do the trick. Sauna, pool and a good breakfast buffet are pleasant additions. What are the cons? If you are visiting in summer you may not be too happy with the aircon which doesn’t seem to keep up on hot days. Some rooms open to the inner courtyard, providing only very little natural light. A popular couples’ hotel, the Titanic is located in one of the most charming areas of Mitte, close to Gendarmenmarkt square. It’s a beautiful hotel within walking distance to Museum Island and the historic centre of Berlin. Despite the central location, the hotel is quiet. If you plan a trip in the Christmas season, make sure you check out the wonderful Christmas Market next door. What are the cons? The theatrical design of this hotel may not be to everyone’s taste. If you are going to surprise your girlfriend with a stay at this hotel know her tastes well. Alexanderplatz is the busy center in East Berlin. A great place to stay if you need good transport and shopping. Alexanderplatz is the city center of East Berlin. It is a wide open space surrounded by shops, restaurants, and shopping malls. Nearby Alexanderplatz Station is one of the main train stations that serve Berlin. The TV tower is a widely visible landmark. All around the square with its socialist architecture, there are nice little pockets of older streets, most notably around Hackescher Markt and Nicolai Quarter. To the west, Museum Island is just a couple of steps away, to the east the trendy Berlin neighborhoods of Friedrichshain and Prenzlauer Berg begin. A solid option in the heart of East Berlin, this hotel is recommended for its central location just two minutes from Alexanderplatz. The rooms are on the small side but clean and modern, some of them with a view of the famous Berlin TV tower. The location is not romantic (big streets, functional office blocks) but it’s close to public transport which allows you to explore the city with ease. What are the cons? Some people will say that Alexanderplatz is not the safest place at night, so it might not be the best option for single ladies taking the train home at night. Due to the big roads surrounding the hotel, you may be bothered by traffic noise at night when you sleep with an open window. The area is not the prettiest of Berlin, so probably not the right choice for a romantic stay. Casa Camper is one of these funky boutique hotels that sprung up in the last couple of years. It’s popular with couples and young families – not just because of the good location in the cool Hackescher Markt neighborhood. There are 24 hours snacks and a honor bar on the top floor, perfect when you get home to your hotel late at night and you are still hungry. Curiously and true to the nature of a boutique hotel with funky design, the bedrooms do not have a window, but the bathrooms do. What are the cons? Red walls and the reverse window set-up (window in bathroom and not in bedroom) may make some guests feel slightly claustrophobic. This hotel is a great choice for people looking to stay in a serviced apartment. The location is central and busy, yet the rooms are mostly quiet. Hackescher Markt is a typical lively Berlin neighborhood with a variety of little shops, restaurants, and bars. You will also find lots of street art nearby. Museum Island and Alexanderplatz are both in walking distance. What are the cons? Pay attention to the room types: “S” rooms are not apartments as they lack proper kitchen facilities. The tram may be heard in some rooms, but then you need to remember that this a big busy city. Centrally located hostel, just a couple of steps from Alexanderplatz. Well organized, clean, and friendly place with the added bonus of a wonderful rooftop terrace. Some rooms have a balcony. What are the cons? Just like many other hostels, wombat’s can be a bit noisier at night, in particular if you have a room right underneath the bar. Potsdamer Platz is the third of three centers in Berlin. It is located on the former inner German border and is best known for its modern architecture. Standing in Potsdamer Platz today, it is hard to believe that only 30 years ago this area was a complete wasteland. Situated right on the border between East Berlin and West Berlin, there was no reason to rebuilt the area that had been completely destroyed in WWII. This changed, of course, after the Fall of the Wall. Today, completely re-built Potsdamer Platz is a major retail, shopping, and tourist hub. It is home to the Berlin Mall and Potsdamer Platz Arkaden, excellent museums like the Spy Museum and the Dali Museum, kid-friendly options like the Legoland Discovery Centre, a casino, and two international movie theaters. It’s a great location for families who need easy access to family restaurants and activities. 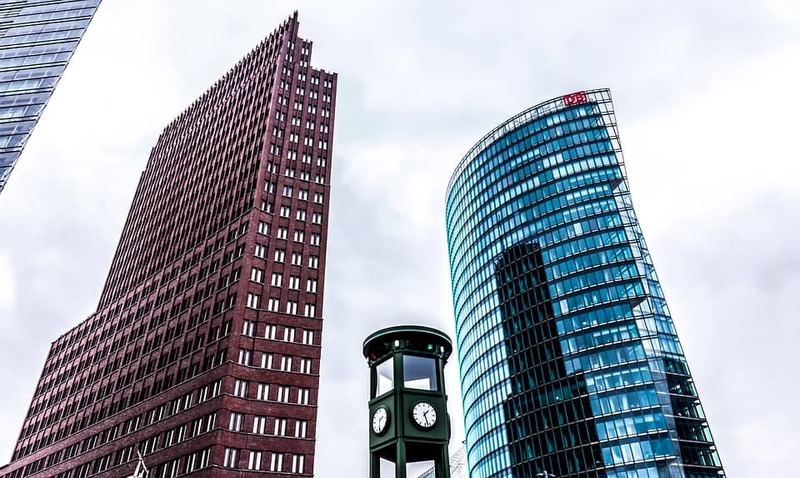 However, the local hotels are mostly catering to well-off business people as Potsdamer Platz is also the representative home for many international companies. A grown-up 5-star luxury hotel, the Ritz-Carlton will not disappoint. Besides the excellent location close to public transport and the points of interest in Potsdamer Platz, you will find here tons of services. This includes a doorman, concierge, turn-down service, and an atmospheric hotel bar. What are the cons? Except for the hefty price tag, you should rest assured that this hotel will meet your expectations in every way. If you cannot live without a kitchen while on holidays, then this hotel is the perfect choice. Not only that: For a romantic candlelight dinner, book at table on the rooftop terrace of FACIL restaurant. It’s a pretty design hotel with lots of little details, a spa, and an excellent location just across from the Sony Centre. What are the cons? The hotel is a former condo building which has been converted to a hotel. This makes the lobby and lift area small and not welcoming. Also, some guests feel a lack of privacy due to the closeness of the neighboring building. The Grand Hyatt is a popular business hotel at Potsdamer Platz which is also great for couples. It is modern and luxurious with comfortable, big rooms and a great service. The hotel comes with a relaxing pool and spa area on the top floor which is great after a day of shopping and sightseeing. Vox restaurant serves an excellent breakfast buffet. What are the cons? Unless you have booked a rate which includes Wifi, be prepared to pay a lot of money to stay online. Kaiser Wilhelm Memorial Church in City West was severely damaged in WWII and left in this state as a reminder of the horrors of war. The former heart of West Berlin can be found around Wittenbergplatz in the suburb of Charlottenburg. Along the main streets of Kurfürstendamm and Tauentzienstrasse visitors will find lots of great shopping options, including the Europa Center (the first West German shopping center), the hip Bikini Shopping Center, and the KaDeWe. 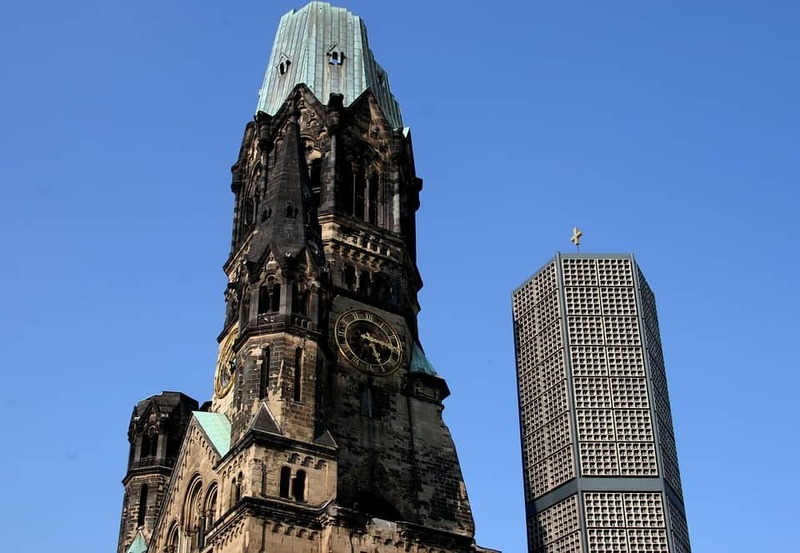 One of the best known Berlin attractions can also be found in the City West: The Kaiser Wilhelm Memorial Church, once destroyed during WWII, now left in a ruined state to remind people of the destruction of war. Families will want to visit Berlin Zoo which is located right opposite Bahnhof Zoo railway station. A little bit farther away, Charlottenburg Castle is a pretty royal castle with a formal English garden. Nearby, Museum Berggruen is considered one of the best of the city. Wannsee lake and Grunewald are popular day trip destinations for Berliners. Potsdam is also closer to West Berlin than East Berlin, saving you time on the train when exploring this exciting city on a day trip. Who should stay in Berlin City West: City West is perfect if your focus lies on the points of interest that are in the western parts of Berlin. You will enjoy various shopping and entertainment options while at the same time have quick access to West Berlin attractions. The great thing is that rates are generally cheaper than staying in locations like Potsdamer Platz and Alexanderplatz. It is also a very safe area. Reasons to stay in Berlin City West: Close to ICC Conference Center, Wannsee, Grunewald, and Berlin Zoo. The best place to stay in West Berlin is around the shopping area that surrounds Bahnhof Zoo station, Wittenbergplatz and Kudamm. You will find here plenty of shops, restaurants, and attractions. This energetic hotel is located right in the center of Berlin City West, an excellent location to make full use of the shops and entertainment options nearby. Right next door you will find the new Bikini shopping mall with funky designer shops and trendy street food outlets. Just like the shopping mall is this hotel ultra funky, hip and full of life. It comes with a cool bar, free bike rental, and a handy rooftop terrace. Some views overlook Berlin Zoo. What are the cons? No door in the showers which can be a privacy issue for some people. Noisy when the DJ is at work in the bar. And yes, it’s lively – so if you want to have an early night this hotel might not be for you. A luxury hotel right in the center of West Berlin, this hotel offers spacious rooms and bathrooms with lots of amenities. It comes with a French restaurant, a relaxing spa area, and an elegant lounge bar. What are the cons? As it sometimes happens with big chain hotels, you may find that the Sofitel is overall great but lacks a little bit of personality. Less pricy than the other two option in Berlin City West, this Mercure is a great value hotel. It’s perfectly located and offers great service and comfortable rooms. The hotel is particularly handy for a short stay in Berlin as it close to everything, and you will even find a German restaurant next door. The subway stop is right in front. What are the cons? The rooms are more on the small side but otherwise the hotel offers good value for money. For visitors to Berlin, the suburbs right next to Mitte – Prenzlauer Berg, Friedrichshain, and Kreuzberg – are of most interest. Why? Because the streets are lined with beautiful old-world buildings, while cafes and restaurants occupy the broad sidewalks and inner courtyards. This is very the locals live, this is where you too can feel like a Berliner. Neglected for many decades before the end of the GDR regime, the houses in Friedrichshain and Prenzlauer Berg have today mostly been renovated to a high standard. This caused a dramatic shift in the local population and triggered a massive gentrification process. Kreuzberg is slightly different from the other two suburbs mentioned here. As part of West Berlin, it has been home to a vibrant multi-cultural working class community since the 1960s. However, gentrification occurs here as well. Visitors to these inner city suburbs will see predominately young professionals, expats, families with little children roaming the streets. Staying in these suburbs means that you can mix with the local crowd and enjoy lots of off-the-beaten-path experiences. It is also here that you will find the latest trends and unique ideas. Who should stay in Prenzlauer Berg/Friedrichshain/Kreuzberg: For flair and a local feeling, book accommodation in these safe and quiet suburbs. If you want to mix with the local crowd and pay local prices, there is no better place. The suburbs are well-connected and close to the main attractions, yet give you a true Berlin experience. Perfect for young couples and families who prefer hostels over hotels but there are also some budget hotel options available. Reasons to stay in Prenzlauer Berg/Friedrichshain/Kreuzberg: Charming neighborhoods with a young, dynamic crowd. Best place to find a hip hostel in Berlin. Berlin Mauerpark in Prenzlauer Berg is the location of one of the best flea markets in Berlin. Prenzlauer Berg is just north of Mitte and is a highly gentrified suburb for well-off families with small children. In summer, the locals flock to the streets, sip lattes in the street cafes, watch their children play in the many parks, and shop in the farmers’ markets. The best area to watch the locals is around Kollwitzplatz. The farmers’ market is open all day on Saturdays. Another popular area is around Mauerpark which attracts young people, musicians, and artists. 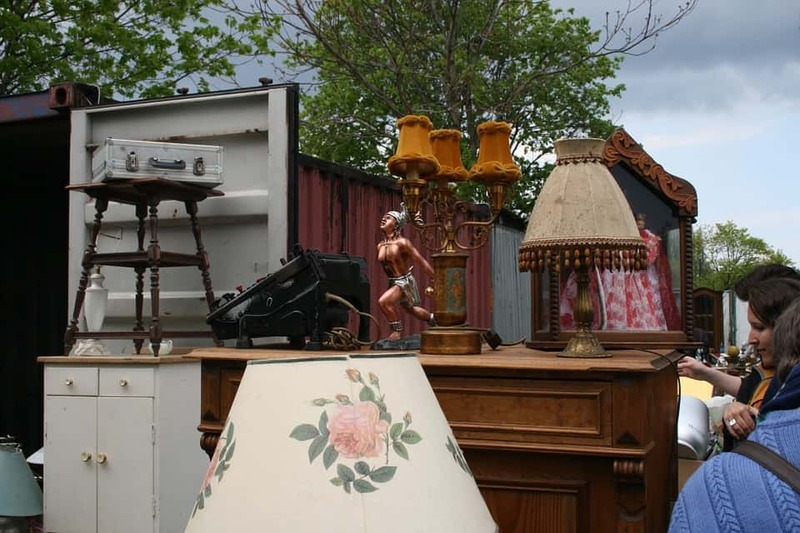 On Sundays, visit the excellent flea market here. Kulturbrauerei is a culture center with lots of different events including live music and food trucks on weekends. Bars, restaurants and small shops can also be found around Winsviertel. You will not find big hotels in Prenzlauer Berg but some really good hostels. It is not a party location but there are plenty of bars and restaurants around to keep you busy. This hostel is located in the heart of Prenzlauer Berg in a quiet street. It offers dorms and rooms with free Wifi as well as a cozy backyard with seating. The kitchen is well equipped, the bathrooms clean. The hostel also offers a free walking tour. What are the cons? No lifts. This hostel is not the best choice for party people. Oberbaumbrücke connects the neighborhoods of Kreuzberg and Friedrichshain. While gentrification is also a big topic in Friedrichshain, in this inner suburb you can still find some raw and unpolished corners. 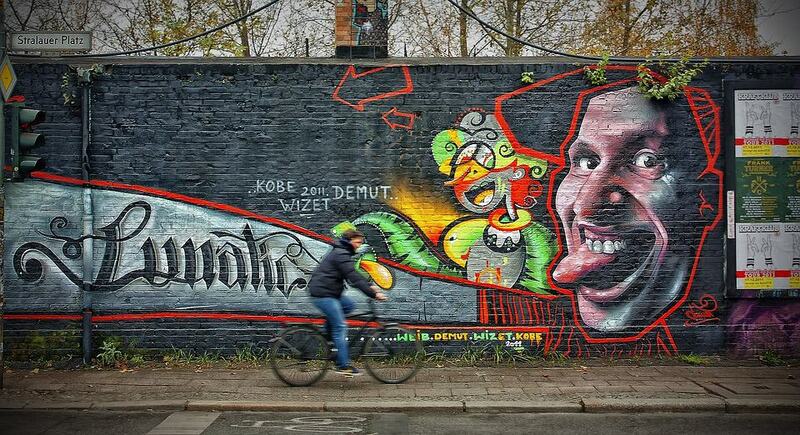 Students, artists, and party people love the crazy yet peaceful atmosphere of Friedrichshain. In Simon-Dach-Strasse you will get cheap cocktails and delicious snacks, and nearby Boxhagener Platz is home to a popular flea market. Revaler Strasse is the epicenter of electro house, Berghain one of the best known clubs in Germany. But it’s not just the nightlife that attracts people to this neighborhood. 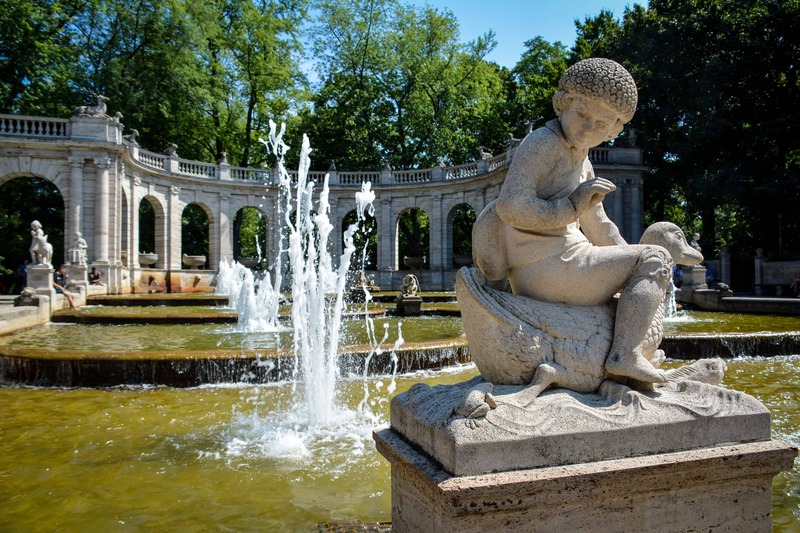 In the north of the suburb, Volkspark Friedrichshain is a popular park with a wide range of picnic areas, playgrounds, sports facilities, and cafes. There is also a major Berlin attraction in Friedrichshain: East Side Gallery is a section of the Berlin Wall on the banks of the River Spree. Local and international artists have transformed the dull gray concrete into a coloful open-air street gallery. One of the best selling accommodation options in Berlin, Luxoise Apartments offers contemporary furnished apartments in the heart of Friedrichshain. You will find yourself close to everything that the Friedrichshain neighborhood has to offer. Thanks to the proximity to the next U and S station you can easily explore the rest of Berlin. Bike rental available as well. What are the cons? There is no lift. Located just opposite the East Side Gallery, this cheap and friendly hotel is perfect for party people and fun loving city explorers. Thanks to nearby Ostbahnhof station you are well connected to other German cities as well as locations in Berlin and Brandenburg. The rooms are clean and furnished in bright colors. Some of them overlook the River Spree. What are the cons? Private rooms are small and there is not a lot of storage space. The overall feel is that of a youth hostel, so if you are after a grown-up hotel, look somewhere else. Perfectly located right in the centre of Friedrichshain, this small boutique hotel offers clean rooms and a friendly atmosphere. Simon-Dach-Strasse is one of the most popular nightlife streets in Berlin. This hotel is particularly well suited for young couples looking for a peaceful retreat. It is also pet-friendly. What are the cons? Can’t think of any! Particularly interesting for younger travelers, Industriepalast is perfectly located in the heart of Friedrichshain. Accommodation is simple and cheap, with a choice of dorms and private rooms. 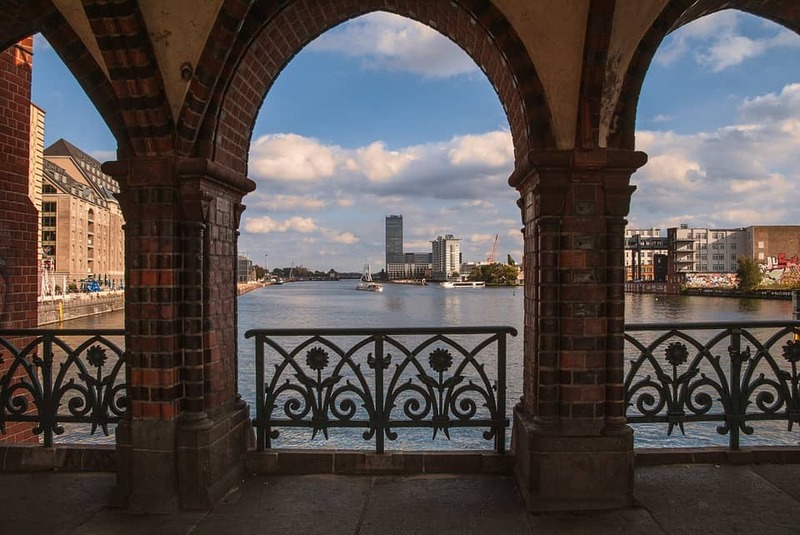 East Side Gallery and Oberbaumbrücke are just few steps away. In two minutes you can reach S and U station Warschauer Strasse, providing you with quick access to other parts of the city. What are the cons? Cheap and noisy option when all you want is a bed for the night and a great location close to the best known clubs in Berlin. 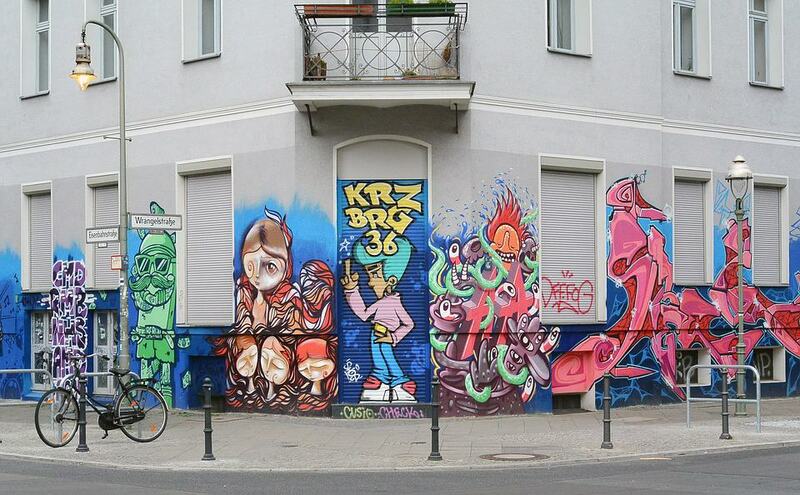 Kreuzberg is a great Berlin neighborhood if you like to see an alternative side of the city. Just across the river from Friedrichshain is Kreuzberg, a Berlin neighborhood that has been joined with Friedrichshain but is a different world altogether. Separated from Friedrichshain by the Berlin Wall for many decades, things developed quite differently in Kreuzberg. The neighborhood traditionally is a working-class area with lots of families who have come from other parts of the world: from Turkey, mostly, but also the Middle East, and East Europe. 40% of Kreuzbergers have multicultural roots. This diversification is evident everywhere: Women with headscarfs walk down the sidewalks, shisha bars, tea rooms and Turkish supermarkts line the streets, travel agents sell tickets to Warsaw and Kiev. It is also one of the most populated areas in Berlin. Some exciting attractions can be found in Kreuzberg. Checkpoint Charlie in the north connects Kreuzberg with Mitte and is the former inner German border crossing in the American sector. Oberbaumbrücke is the pretty bridge over the Spree which was another border crossing into East Berlin. Noteworthy museums in this suburb include the Jewish Museum, Topography of Terror, and the Urban Nation Museum. There is also a lot of fantastic street art in the area. To those who have been to Kreuzberg before, Orania.Berlin may come a bit as a surprise. This first-class luxury hotel looks like it really shouldn’t be there at all. From the Indian style furnishings to the scrumptious buffet breakfast, this hotel stands out from the crowd. The downstairs lobby is extremely cozy; live music in the evenings. What are the cons? Spiderwebbed glass panels on the lower floor and paint bombs on the pretty facade of the 19th century building are clear signs that this hotel is not yet quite welcome in the neighborhood. Checkpoint Charlie in Kreuzberg is a great location if you want to stay close to the important tourist attractions, yet at the same time get a taste of Kreuzberg’s local vibe. Mondrian Suites offers well equipped apartments in a well-connected location. What are the cons? A no-nonsense choice that is less suited for a romantic weekend away. A relaxing boutique hotel in a quiet location, comfortable and stylish. It is perfect if you like to stroll around the neighborhood and along the pretty canal that cuts through Kreuzberg. What are the cons? The hotel is located in a residential area. You will need to walk a bit further to find a selection of bars and restaurants. My personal favorite in Berlin is Downtown Apartments in Mitte. We stayed there many times before we moved back to Berlin, and it’s a great option in particular for families. 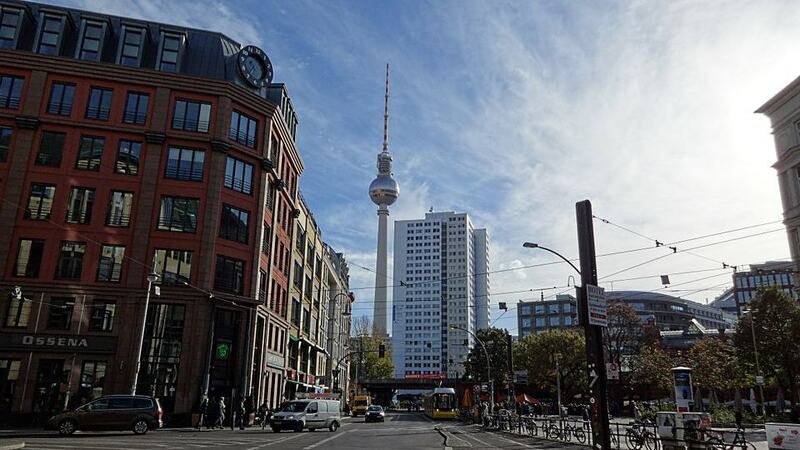 Downtown Apartments is located in Mitte, just few steps from the next U and tram stops. The Wall Memorial is in walking distance. We love the contemporary feel of the apartments and the fact that in some apartments you can separate the bedroom from the living area via a sliding door. This is great for families who prefer not to sleep in the same room with kids. Thanks to the kitchen facilities you can save money by preparing your own meals, and there are also a number of great restaurants in the area. Our apartment also had a big balcony with park views. What are the cons? In summer, the outdoor area of the pub downstairs can get noisy but staff will close the terrace at 10pm. Where to stay for sightseeing? As explained above, Berlin is a city where you cannot go without using public transport to see the many sights. Having said that, Mitte will be where you would find the best known Berlin attractions, in particular in the area between Reichstag and Alexanderplatz. From a tourist point of view, this is the most central place to stay in Berlin. 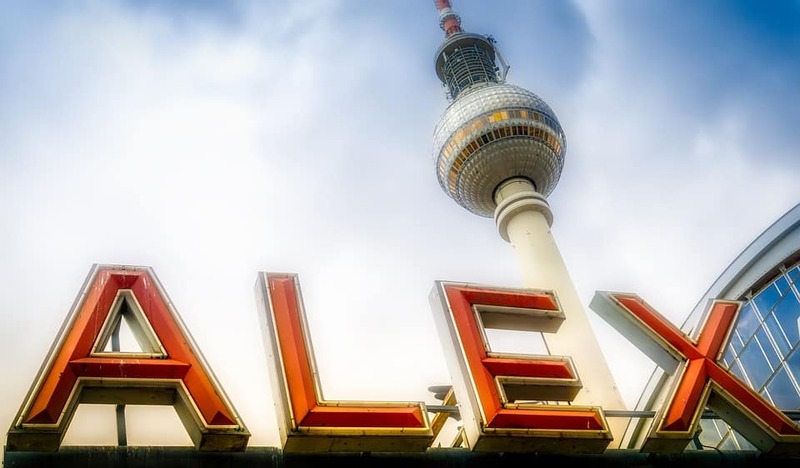 Is Alexanderplatz a good place to stay? While Alexanderplatz is an important transport hub in Berlin with plenty of shopping and restaurant options nearby, I personally would prefer staying in a more charming area of Berlin. There are many areas that are not dominated by car traffic and cubic-style high-rises, for example Kreuzberg or Hackescher Markt. None of the hotels listed in this post has paid to be included. Instead, they have been picked based on personal experience and feedback. Need free help planning your trip to Berlin? Feel free to shoot me a message or comment below!